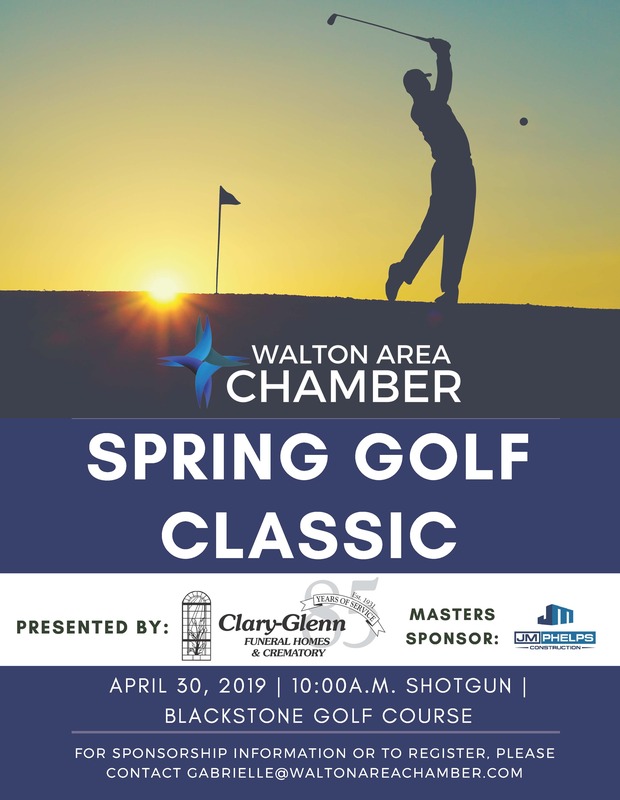 The Walton Area Chamber of Commerce is pleased to announce their Third Annual Spring Golf Classic on Tuesday, April 30, 2019, presented by Clary-Glenn Funeral Homes and Crematory. For the third year, the Walton Area Chamber of Commerce Spring Golf Classic will take place at Blackstone Golf Course in Mossy Head, Fla. Registration will begin Tuesday, April 30, at 8:30 a.m. with a shotgun start at 10 a.m. Entrance fees are $400 for a four-person team with only 25 team slots available. Hole sponsorships are available for $100. All tournament players will receive complimentary food and drinks on the course, a cut and light cigar bar by Shore Thing Cigars, and an invitation to the 19th Hole Celebration after-party and awards ceremony following the tournament at the Blackstone Golf Course Club House. The tournament and after party are open to the public. Golfers can register a team or individually by emailing gabrielle@waltonareachamber.com. A number of local businesses and community partners have graciously stepped forward as sponsors of the upcoming 2019 Spring Golf Classic. Masters Sponsor: JM Phelps Construction; Golf Cart Sponsors: Clark Partington and Chautauqua Rehabilitation and Nursing Center; Eagle Sponsors: CHELCO and Epic Photo Co.; Hole In One Sponsor: Community South Credit Union and Shore Thing Cigars; Hole Sponsors: Nick’s Seafood Restaurant, Acme Oyster House, and Herbafex; 19th Hole Sponsor: Okaloosa Gas. Sponsorships are selling rapidly and only a few remain. For more information on sponsorship, volunteering, or to register to play, please contact Gabrielle Kilgore at gabrielle@waltonareachamber.com or call (850) 892-3191.